Summer has officially come to a close but that doesn't mean we can't enjoy the fruits of our labor. Here's a late summer Peach Tart recipe from Carrolluna. Absolutely peachy keen! This recipe is divided into three steps - the pastry, the custard, and the topping. Whisk together the flour, sugar, lemon zest and salt in a bowl or food processor for about 10 seconds. Add the butter and mash with back of fork or process until the mixture resembles coarse crumbs. Add egg yolk, mixing until the dough comes together in a ball. Grease the bottom of a 9-inch tart pan. Dust the pan with flour, tapping out the excess. Pat the dough evenly over the bottom and up the sides of the prepared pan. Thoroughly prick the bottom and sides with fork. Refrigerate for 30 minutes and then bake until golden brown, approx. 18-22 minutes. Remove crust from oven, brush the warm dough with the egg wash (whisk egg yolk & salt) to seal the dough (prevents sogginess). Bake for an additional 2 minutes until set. Set crust aside to cool. Whisk together sugar, flour, cornstarch and yolks in a medium bowl until thick and pale yellow. In a medium saucepan, bring milk to a simmer. Next, temper the egg mixture by gradually pouring about 1/3 of the hot milk into it, then whisking to combine. Scrape the egg mixture back into the pan and cook over low to medium heat. Keep stirring the pot to prevent scorching, until the custard is thickened and beginning to bubble. Scrape the custard into a clean bowl and stir in the vanilla. Cover the surface fo the custard with a piece of cling paper (or parchment paper) to prevent a skin from forming. Let cool, then refrigerate before using. Assemble the tart by spreading the custard over the cooled crust. Then proceed to decorate it with the fruit. 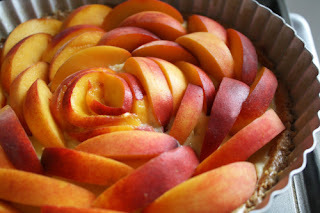 Place sliced peaches diagonally forming circles along the crust. After the tart is assembled, sprinkle brown sugar on top and return to the oven to soften the fruit and ward up the crust for about 15-20 minutes.